that are designed to help set your business up for success. any problems in person or remotely. Better manage your cannabis store with our feature-rich Store Management & POS solution. With TechPOS Store Management and POS solution, improve efficiency, increase profit, and reduce compliance headache. TechPOS’s Web-Menu opens an online revenue stream beside your physical cannabis store. The added revenue stream increases store profit and improves the customer convenience. With TechPOS Express Checkout, not only cannabis customers engage with the store products but also purchase process is sped up. To boost customer experience, every store will need to showcase hot products, display currents promotion, and convey product information to their in-store customers. TechPOS Digital Signage eases this process by integrating with Store Management and POS Solution. 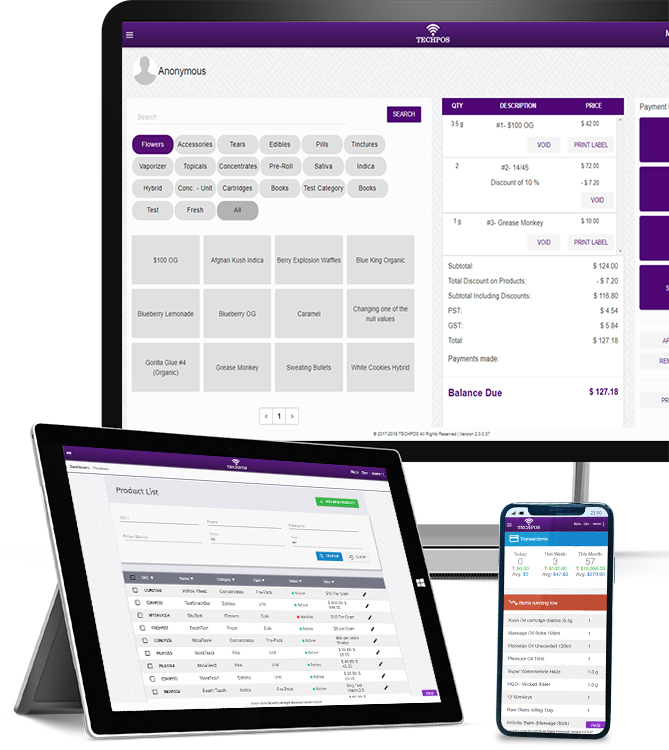 TechPOS ( POS Tailored for Cannabis ) is a state-of-the-art store management solution. This product is the only reliable solution in the market with dedicated customer service and complies with government (Canada Revenue Agency) reporting, complies with Canadian Privacy Laws and Regulations, and it has full Data Backup and Restore to accelerate your transactions and order takings. Point of Sale is heart of our system, it’s were most of the customers spend their time and because of that we have designed a user-friendly, robust and secure system to serve our customers. Inventory management is one of the essential tools of any successful retail business. Our inventory management was inspired by the architecture of warehouse systems capable of seamlessly processing millions of real-time transactions. Providing the correct information to customers is crucial; no cannabis retailer wants to misinform their customers. Whatever product information is displayed on the online store must match the information provided in-store through digital signage. The most innovative feature we offer, the dashboard gathers, processes, sorts and summarizes all of the store’s data, while also allowing the manager to obtain an overview of staff, inventory, sales and performance in real-time. Health Canada has stipulated that all licensed cannabis activity—including sales, deliveries, and losses—must be recorded in the national Cannabis Tracking System (CTS). They require cannabis stores to submit this data as a report monthly. It is important to have the adequate number of systems and right type of hardware in your store. Based on the size, location and type of target consumers, cannabis stores may need various combination of hardware. You don’t want to have a huge line up for your cashier to process the purchases. This is crucial to deliver comfortable customer experience. We work with various types of cannabis stores in different locations and, as a result, can better estimate the hardware requirements. Store Manager and/or Store Owner: The store manager/owner mostly surf the business insights, administration, government reports etc. Store Staff: The store staff mostly spend their time on POS interface. For each of these categories, it is fundamental to have right user interface design. Each component of TechPOS products is designed with consideration of the corresponding category for that specific component. Nevertheless, training sessions boost up the performance and improve the learning curve; as a result, we offer free training to our customers. Every software system is updated in order to deliver the latest and greatest software experience and features. TechPOS is no different, we are always improving and expanding our software features and therefore will update our products as needed. However, to ensure our customers don’t experience difficulties, the updates are done in periods where the system is not used by our customers. Our hardware set up is as simple as starting up your new computer. You’ll have the system up and running buy hooking up a few wires. Although we believe TechPOS products are plug and play, we can walk you through the set-up to speed up the process. As a customer-centric company, it is important for us to support our customers in every way that we can and to listen to their feedback. We are here to answer your technical and generic questions at shortest time possible. They as a Vancouver Medical Cannabis Retailer are crafters and cultivators who believe in the healing and medicinal properties of marijuana. WestCanna offers a remarkable experience with a wide selection of herbal remedies for their customers.